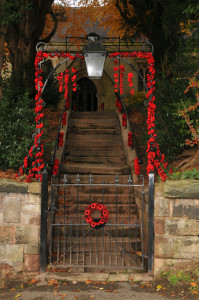 A warm welcome awaits you at any of the services at 11:15am every Sunday morning. Sunday 27th January 2019 – Family Service (Members of Children’s Church to take part). Sunday 10th February 2019 – Family Service (Children’s Church invited to take part). Sunday 10th March 2019 – Family Service (Children’s Church invited to take part). Sunday 31st March 2019 – Mothering Sunday (Family Eucharist – All Children invited to take part). Sunday 12th May 2019 – Family Service (Children’s Church invited to take part). Please visit The Loggerheads Benefice website where you will find details of what we believe, our worship and events. 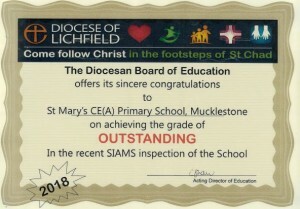 Please click here to see our full Statutory Inspection of Anglican and Methodist (SIAMS) Report. Year 5 children were invited by the Arch Bishop of Stafford to join a religious retreat, with two other primary schools, for two days. The children took part in many fun activities to put the “Wow!” back in “Worship” and have then lead the worship back at school. Focus on Faith May 2018 – Whole school church visit to Ashley Methodist Church, Our Blessed Lady and Saint John the Baptist Catholic Church, Ashley and St Mary’s Church, Mucklestone.